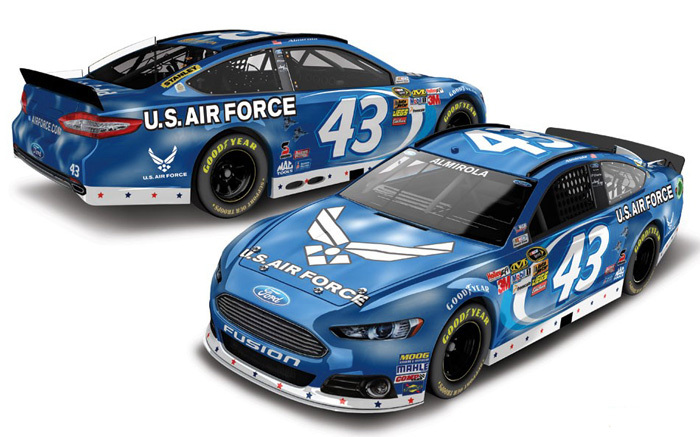 2013 Aric Almirola #43 Smithfield Blue / Ford Fusion NASCAR diecast, by Action. 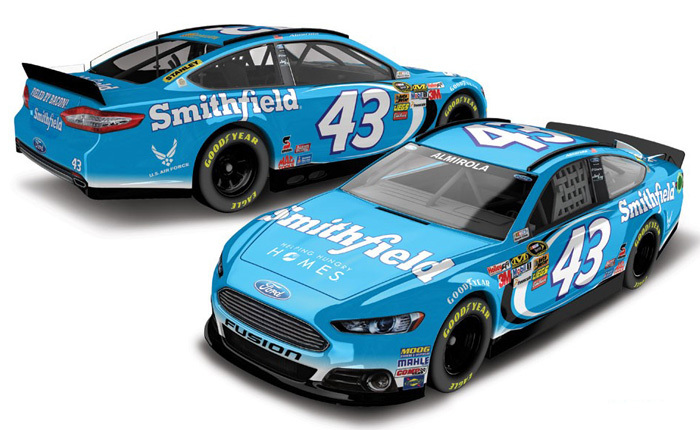 The Richard Petty Motorsports #43 Smithfield Blue Ford was raced by Aric Almirola in select events during the 2013 NASCAR Sprint Cup season. 2013 Aric Almirola #43 Gwaltney / Ford Fusion NASCAR diecast, by Action. 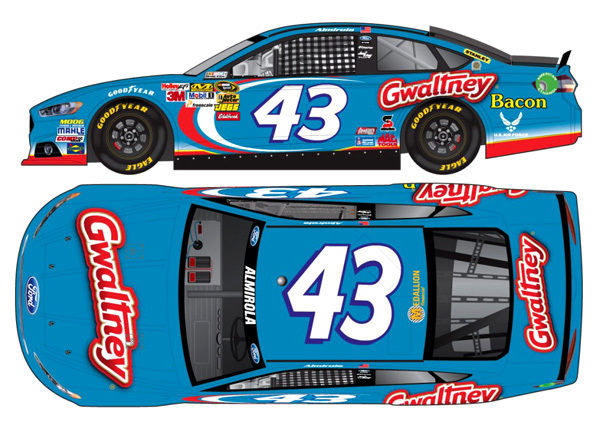 The Richard Petty Motorsports #43 Gwaltney Ford was raced by Aric Almirola in the NASCAR Sprint Cup, Aaron's 499 at Talladega Superspeedway on May 5, 2013. 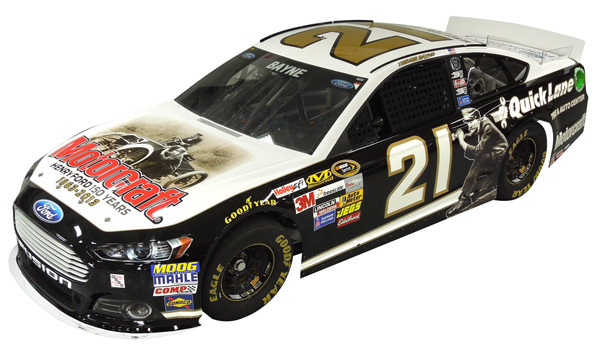 2013 Trevor Bayne #21 Motorcraft / Henry Ford 150 Years / Ford Fusion NASCAR diecast, by Action. The Wood Brothers Racing #21 Henry Ford 150 Years Ford was raced by Trevor Bayne in the NASCAR Sprint Cup, Brickyard 400 at Indianapolis Motor Speedway on July 28, 2013. 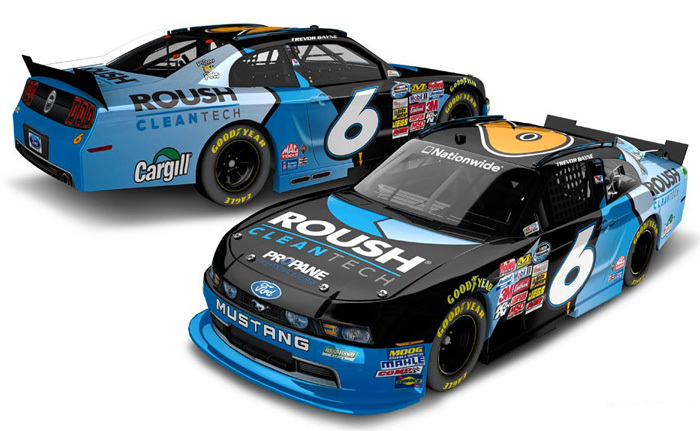 2013 Trevor Bayne #6 Roush CleanTech / Ford Mustang NASCAR diecast, by Action. 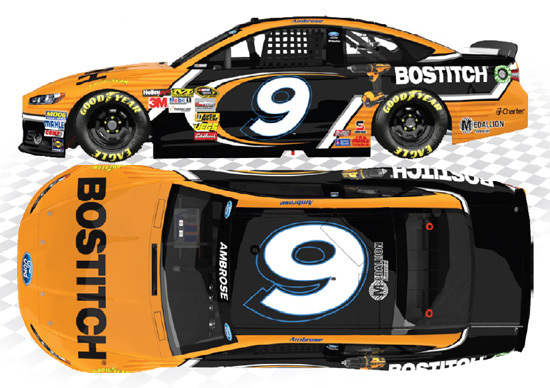 The Roush Fenway Racing #6 Roush CleanTech Ford Mustang was raced by Trevor Bayne in the NASCAR Nationwide Series, Alliance Truck Parts 250 at Michigan International Speedway on June 15, 2013. 2013 Trevor Bayne #6 Winn Dixie / Ford Mustang NASCAR diecast, by Action. 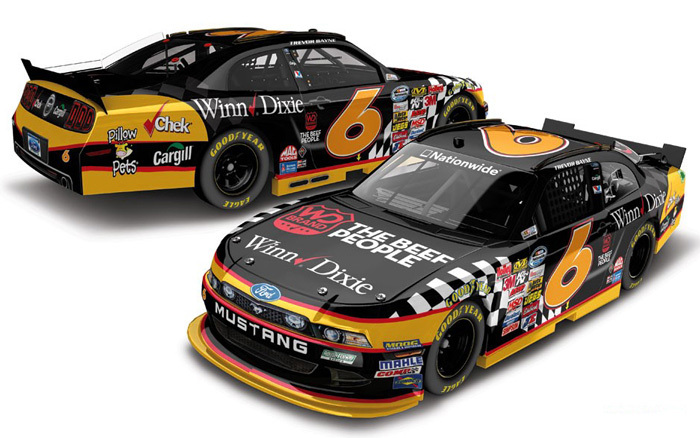 The Roush Fenway Racing #6 Winn Dixie Ford Mustang was raced by Trevor Bayne in the NASCAR Nationwide Series, Subway Firecracker 250 at Daytona International Speedway on July 5, 2013. 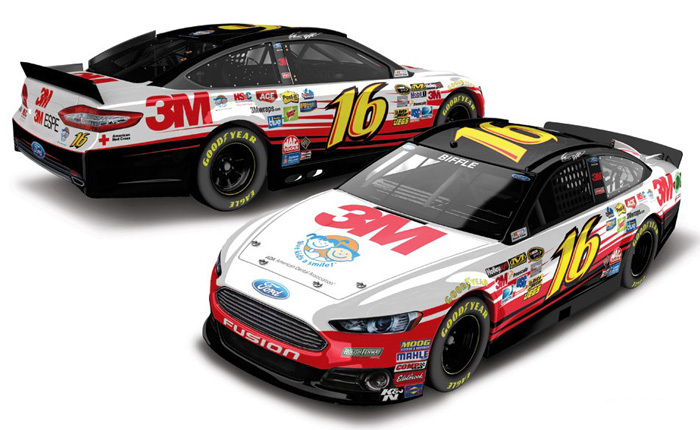 2013 Greg Biffle #16 3M Give Kids a Smile / Ford Fusion NASCAR diecast, by Action. The Roush Fenway Racing #16 3M Give Kids a Smile Ford was raced to victory by Greg Biffle in the NASCAR Sprint Cup, Quicken Loans 400 at Michigan International Speedway on June 16, 2013. 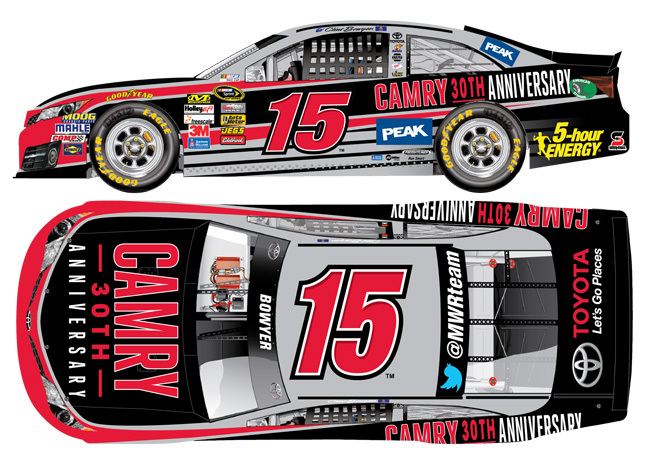 2013 Clint Bowyer #15 Camry 30th Anniversary / Toyota Camry NASCAR diecast, by Action. The Michael Waltrip Racing #15 Camry 30th Anniversary Toyota was raced by Clint Bowyer in the NASCAR Sprint Cup, Feed the Children 300 at Kentucky Speedway on June 28, 2013. 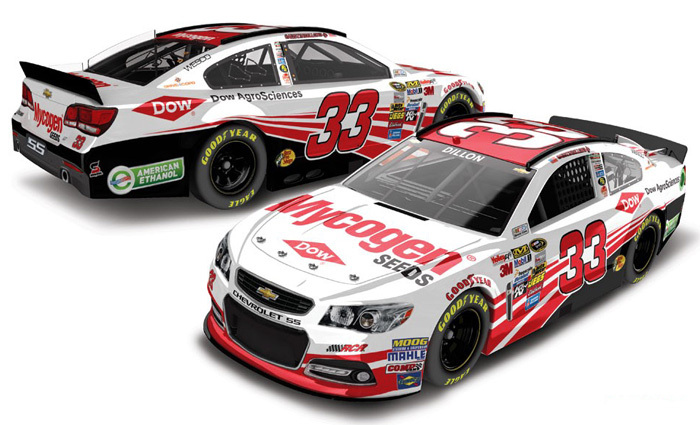 2013 Austin Dillon #33 Mycogen Seeds / Chevrolet SS NASCAR diecast, by Action. The Richard Childress Racing #33 Mycogen Seeds Chevrolet SS was raced by Austin Dillon in the NASCAR Sprint Cup, Brickyard 400 at Indianapolis Motor Speedway on July 28, 2013. 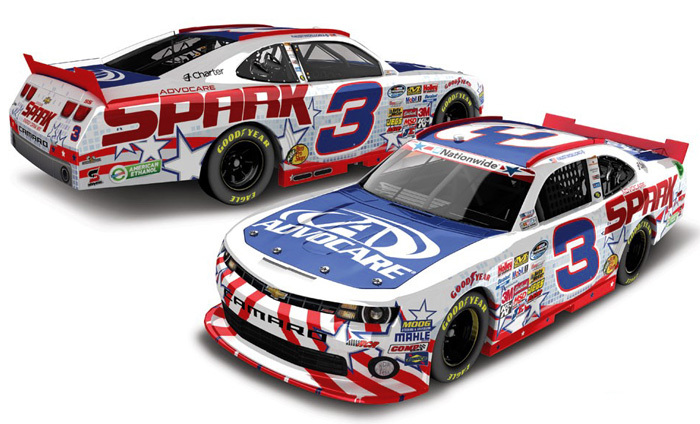 2013 Austin Dillon #3 AdvoCare / Chevrolet Camaro NASCAR diecast, by Action. 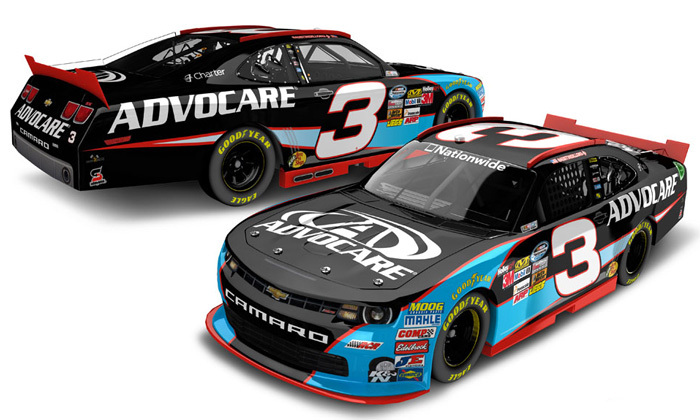 The Richard Childress Racing #3 AdvoCare Chevrolet Camaro was raced by Austin Dillon during the 2013 NASCAR Nationwide Series season. 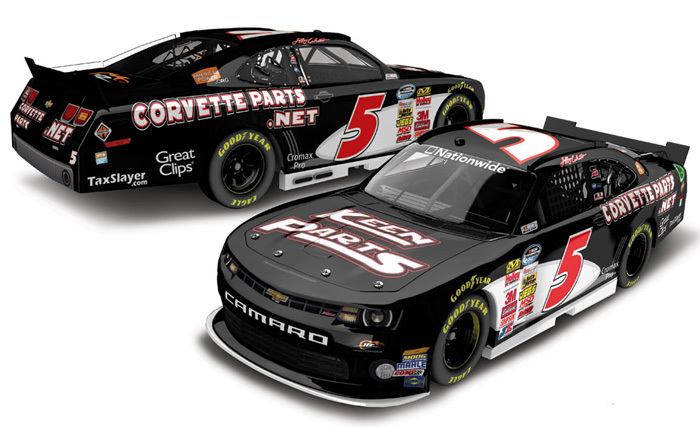 2013 Ty Dillon #33 WESCO / Chevrolet Camaro NASCAR diecast, by Action. 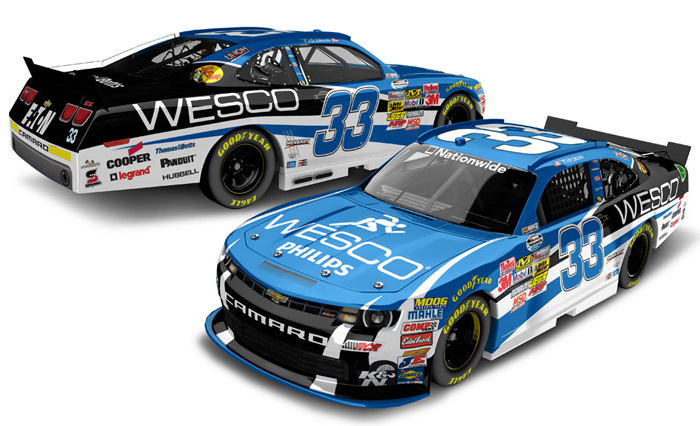 The Richard Childress Racing #33 WESCO Chevrolet Camaro was raced by Ty Dillon in select races during the 2013 NASCAR Nationwide Series season. 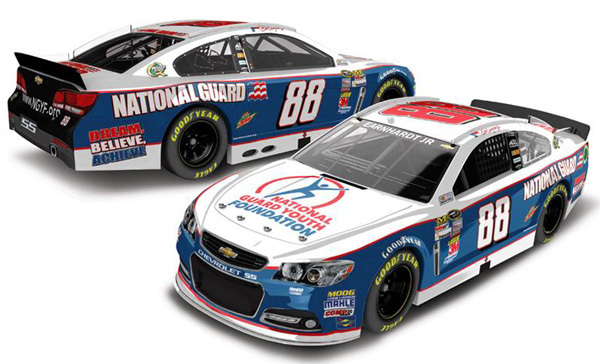 2013 Dale Earnhardt Jr #88 National Guard Youth Foundation / Chevrolet SS NASCAR diecast, by Action. The Hendrick Motorsports #88 National Guard Youth Foundation Chevrolet SS was raced by Dale Earnhardt Jr in the NASCAR Sprint Cup, Quaker State 400 at Kentucky Speedway on June 29, 2013. 2013 Jeff Gordon #24 Pepsi Max / Chevrolet SS NASCAR diecast, by Action. The Hendrick Motorsports #24 Pepsi Max Chevrolet SS was driven by Jeff Gordon in the NASCAR Sprint Cup race at Phoenix International Raceway on 3/3 and Indianapolis Motor Speedway on 7/28/13. 2013 Jeff Gordon #24 AARP Drive to End Hunger / Ride with Jeff / Chevrolet SS NASCAR diecast, by Action. The Hendrick Motorsports #24 Ride with Jeff Chevrolet SS was raced by Jeff Gordon in the NASCAR Sprint Cup, GEICO 400 at Chicagoland Speedway on September 15, 2013. The "Ride with Jeff Gordon" promotion allows fans to donate $124 to have their names placed on the hood. 2013 Kevin Harvick #33 Fast Fixin' / Chevrolet Camaro NASCAR diecast, by Action. The Richard Childress Racing #33 Fast Fixin' Chevrolet Camaro was raced by Kevin Harvick in the NASCAR Nationwide Series, Dollar General 300 at Charlotte Motor Speedway on October 11, 2013. 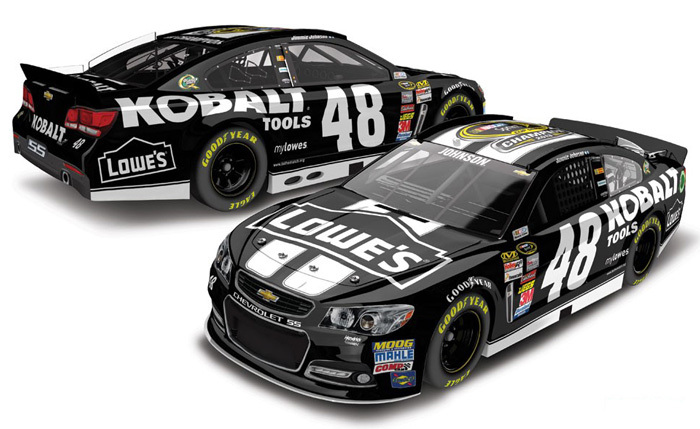 2013 Jimmie Johnson #48 Kobalt Tools / NASCAR Sprint Cup Series Champion / Chevrolet SS NASCAR diecast, by Action. 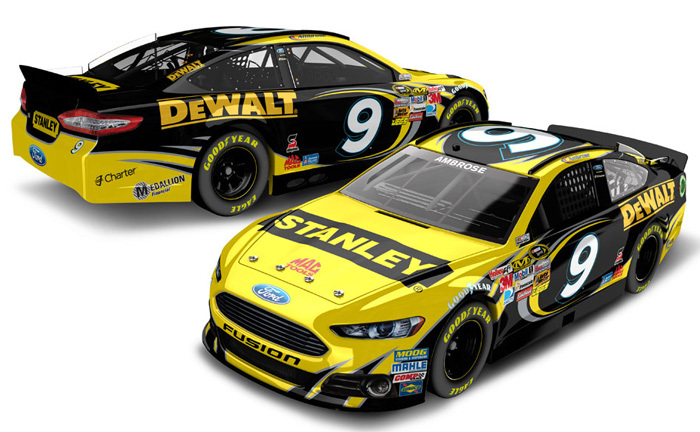 This diecast car features the 2013 NASCAR Sprint Cup Series Championship logo on the roof and will include Championship confetti from Homestead-Miami. Jimmie Johnson, the 2013 and now 6x NASCAR Sprint Cup Champion! 2013 Kasey Kahne #5 Pepsi Max / Chevrolet SS NASCAR diecast, by Action. The Hendrick Motorsports #5 Pepsi Max Chevrolet SS was raced by Kasey Kahne in the NASCAR Sprint Cup, Pure Michigan 400 at Michigan International Speedway on August 18, 2013. 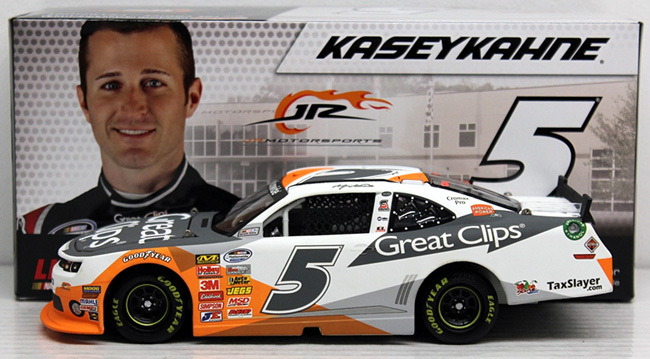 2013 Kasey Kahne #5 Great Clips / Chevrolet Camaro NASCAR diecast, by Action. 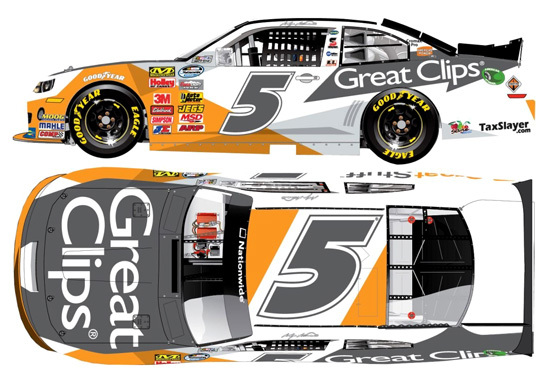 The JR Motorsports #5 Great Clips Chevrolet Camaro was raced by Kasey Kahne in select events during the 2013 NASCAR Nationwide Series season. 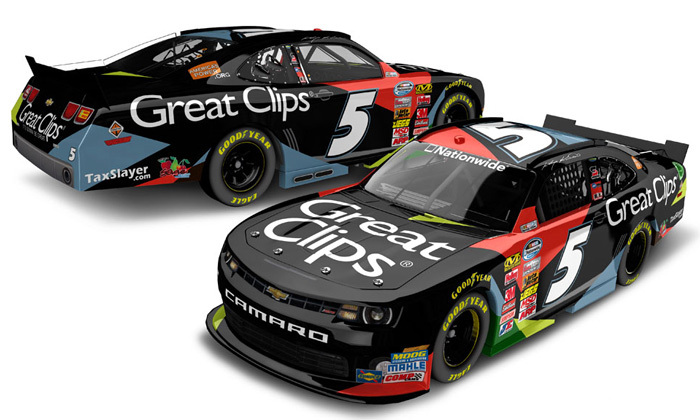 2013 Kasey Kahne #5 Great Clips Great Stuff / Chevrolet Camaro NASCAR diecast, by Action. The JR Motorsports #5 Great Clips Great Stuff Chevrolet Camaro was raced by Kasey Kahne in the NASCAR Nationwide Series, VFW Hero 200 at Darlington Raceway on May 10, 2013. 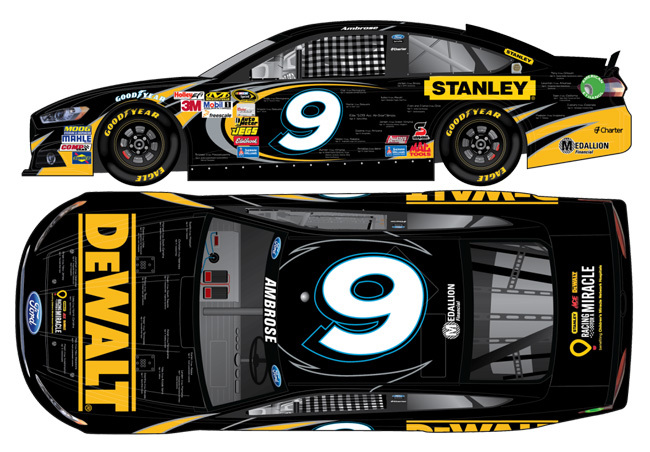 2013 Matt Kenseth #20 Dollar General / Husky / NASCAR Hauler diecast, by Action. 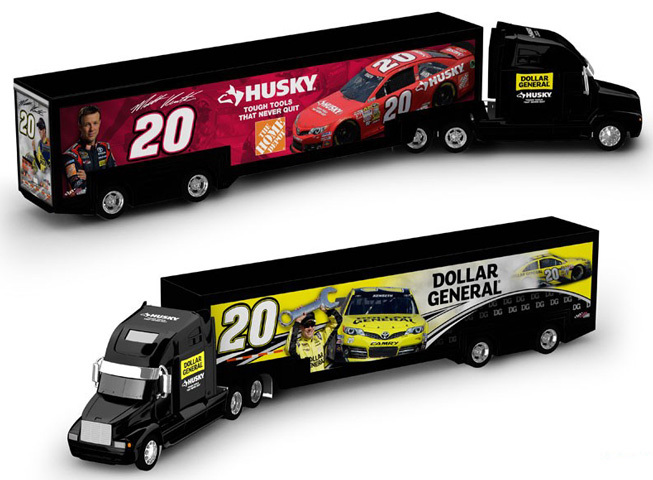 This Joe Gibbs Racing #20 NASCAR hauler features Matt Kenseth's Dollar General car on one side and the Husky car on the other. Action Haulers feature a full metal cab, plastic hauler body with rear opening door, rubber tires and measures 13.5" in length.